We’ve had a longstanding debate about Main Street Heaven—the imaginary after world where Juicy Chicken, Monsoon, Happy Bats and all the other places that once existed on Main Street end up after they’re gone. While our debate had once hinged on the goodness of these independent businesses, we now found ourselves debating which blocks those places used to exist. Like we suddenly didn’t trust our own memories. Where was that junk store where the fantastic lamp was found? 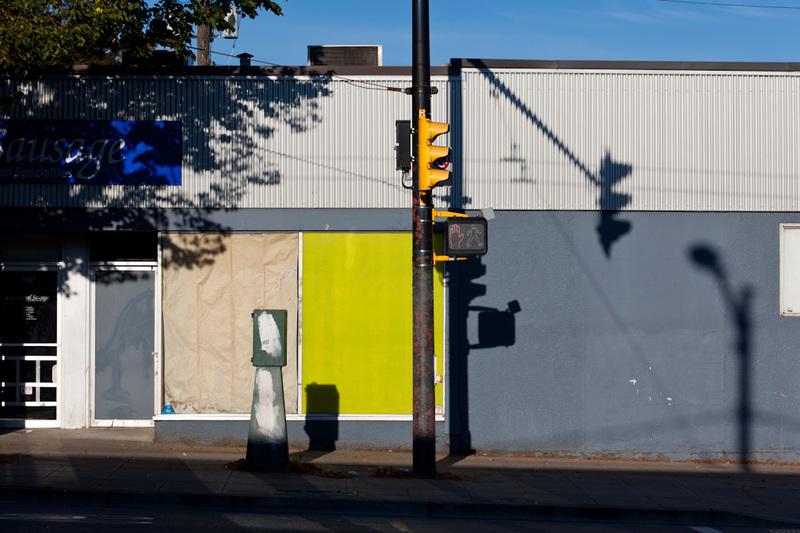 The diners and vitamin stores that had burned down and closed up as recently as six months earlier—where exactly had they been? We reasoned that Instagram and Google Street View were remembering this stuff for us now. So why did it even matter? It was this last question we found ourselves repeating, a week later, at dawn, sizing up the first block of photos at Main and 2nd Avenue. Why exactly does this matter? We still had no answer, but two weeks later, we found ourselves, again in the early morning light, with a camera aimed at the City Centre Motor Hotel on 6th. Over the next five months, we took the equivalent of a 62-block photo—without quite knowing why we were doing it. There was something hopeful in what we were doing. We had come, separately, to live on Main Street in the last decade. After all these years, watching those little emblematic places vanish, it was empowering to finally be doing something about it. Of course, that feeling quickly gave way to the reality that our photos would not bring back the places we missed. Forget about saving those that were doomed. And so our early morning sessions came, slowly, to feel like penance. In part for having lost the ability to trust our own memories, but also, more deeply, because we knew we were that first thrust of gentrification, a little after the artists and punk rockers had begun eking out a place among the Filipinos and Italians, and the word hipster was a badge of honour. We vaguely knew about a time before that too, when Main Street was called a bad part of town or Westminster Avenue, the route to BC’s capital New Westminster. By forcing ourselves, each block, to look closely and remember, we picked out details that we hadn’t noticed in our previous decades exploring our favourite street. Instead of lamenting what had disappeared, we marveled at the resilient hair salons with the old lady names and vintage cash registers, at the place that could fix record players—at the ethos of not giving up on broken down things. But for every old diner and crumbling pizza stop that we shot, there were windows covered up with newspaper and “for lease” signs. On some blocks, the ground had literally opened up beneath our feet—in preparation for the rising luxury condominium towers. Over those six months, the hope we had felt taking photos, still there at the end of autumn, yielded to the realization that what we were doing was saying goodbye to our community. It’s not until you have to say goodbye that you realize how much something mattered. But why does it matter? Maybe it’s as simple as not wanting that glossy version of the Main Street lifestyle sold by real estate developers to be the Main Street we remember. For good or bad, the photos on this blog are how our street looked from May through Sepember, 2011. Maybe you’ll come across this six months from that time period. Or maybe you’re clicking through these photos six years from now. It wasn’t just third wave coffee places and big box Shoppers Drug Marts then. There were empty car lots. There was a theatre where creepy dudes watched pornos. Unsightly facades. The best part of those early mornings were the people who stopped to share their personal histories with the places on each block. Meeting future spouses at bars that no longer existed. Shops their grandparents had owned. Stories of growing up in houses that had long since disappeared. We developed an addiction to these memories and stories. Being up early with a camera turned into an invitation for people we’d always seen around the neighbourhood, but never quite met, to open up and share their memories. And that’s maybe the ultimate impetus for this blog. We hope you’ll share a memory too. Or post an old photo. Or even just a glimpse you caught on your iPhone, stumbling up the hill last night from the Narrow. Maybe you know the method for tying old shoes together and flinging them over telephone lines. Or maybe you have some ideas about why any of this matters. Vancouver-based photographer David Niddrie has worked in the non-profit and progressive media sector for the past decade, shooting for Adbusters, CBCr3, Momentum & others. Equally at home investigating fragments of the city and impressions in the wilderness, David explores the cultural and mental geographies that capture his interest. Jennifer Okrusko is an online producer with over fifteen years of media experience working for organizations such as the BBC, CTV and Global News. She’s a longtime resident of the neighbourhood who still mourns the loss of the Mount Pleasant Pool. Or leave a comment on this blog, thanks! Special thanks to Mount Pleasant Neighbourhood House for their assistance in this project and to 32spokes Web Design for additional WordPress blog development. Interesting project. 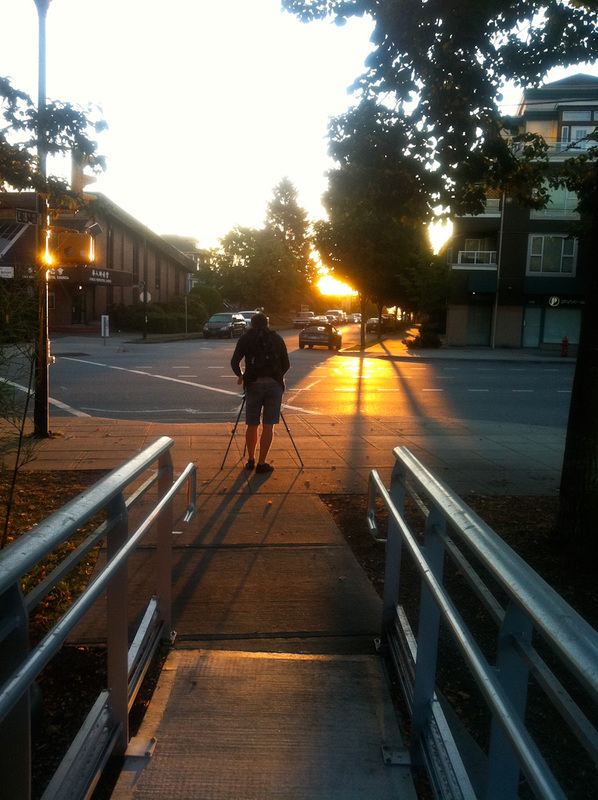 I left Vancouver 20 years ago, because it was breaking my heart. If you’ll excuse the metaphor, it was like gangsters had stolen my girl and forced her into prostitution. I used to refer to the city as “my jewel on the sea.” I lived in neighbourhoods from Robson Street (now the most lurid of tarts), to Oak/Cambie, Kits, Commercial Drive, and Point Grey. All through the eighties, as the first wave of gentrification swept in, I too documented the changes and great landmarks, both grand and grubby. I used a variety of cameras–both 35mm and medium format. The negatives take up several drawers in my filing cabinets. A few of the images were inducted into public and corporate collections in the nineties. I sometimes consider a book. I rarely visit Vancouver now. I don’t recognize the city, though the surrounding mountains–many of which I have climbed–are the eternal lodestar that make me homesick. The town evokes in me the kind of mixed feelings that arise when one meets an old lover: fleeting memories of the intense bond of the affair, along with the realization that it will never be again. My son jumped off the three metre pool platform at Mt Pleasant pool when he was about 3 years old (with a life jacket on!). Man, this brings back bittersweet memories. Thanks for the memory sthrendyle! Impressive diving skills! An interesting and worthwhile project. If these new developments have plenty of green space, some of it just ‘off-curb’ and some of it clearly ‘part of the property’ and only for the use of residents/customers/business use, they will be very wise. I feel if developers include plenty of green space in their plans that itself will decrease much of the resistance to new projects.